Thoroughly cleanse your hands from tough soil with this Kutol 4902 Pro Orange Scrub heavy-duty hand soap. 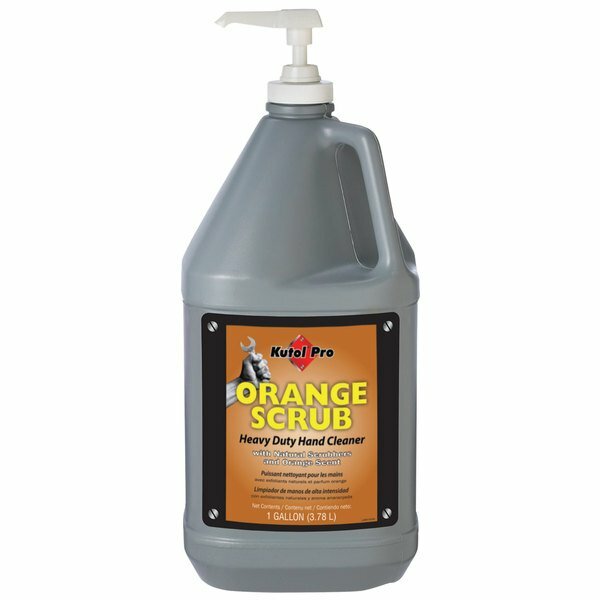 Its heavy-duty cleansing formula combines a mineral oil-based solvent as well as pumice and perlite scrubbers to easily remove tough, caked-on soil, grease, paint, automotive fluid, or other hard-to-remove materials. Whether you need to remove typical dirt and paint from your hands, or you simply need a soap to wash your hands at the end of the day, this scrub hand soap will get the job done. Plus, it boasts an opaque orange color and a pleasant citrus scent. Perfect for automotive shops, construction sites, manufacturing or industrial plants, and printing businesses, this soap is a great option to provide to your employees who are frequently washing their hands throughout the work day. This heavy-duty hand soap comes in a convenient one gallon container with a pump for quick, immediate use. To use, apply to hands before wetting; once the soils loosens, add a small amount of water and continue to rub hands together. Once the soil is completely broken down, rinse hands and wipe dry - removing tough soil can be as simple as that! In order to ensure safe use, this soap boasts less than 1% of VOCs. VOCs, or volatile organic compounds, are found in organic materials such as cleaners, paints, and some air fresheners, and extended exposure to high levels of these chemicals can have negative effects on your health. With an extremely low level of VOCs in this hand soap, you can rely on it to keep your guests or staff clean and healthy with complete confidence! This scrub hand soap comes in a convenient one gallon container with a pump for quick, immediate use. We purchased the Kutol Pro Orange Scrub and were concerned that it wouldn't hold up to GoJo, which we've used for years. Guess what? We love it! it works just as good and doesn't dry our hands out. The Kutol 4902 Pro Orange Scrub Hand Soap sold in 1 gallon pump. It is perfect for getting grease, tar, motor oil, and ect, off your hands. It is not harsh on the hands. The price is great and 1 gallon goes a long way.